Mindful Drawing is a form of practice where we apply the principles of mindfulness – deliberately paying attention with kindly awareness and without judging – to mark making. We draw what we see as we see it. We also explore our experience with all our senses – not just our eyes. So through touching and other sensory explorations we explore our subject in many different ways. Here we explore the face solely by touch - with eyes closed there is no expectation that the marks on the page will resemblance a portrait. In a Mindful Drawing workshop you will not be learning how to draw but rather how to pay attention and let go of pre-conceived ideas. When we practice drawing mindfully we are interested in the process of drawing without worrying about the outcome. This liberation from creating a piece of ‘art’ or something recognisable means we can rest in the beauty of seeing what is in front of us and as we see our pencil moves following the same path as our eyes. Thus we draw what we see and also our experience of what we see and feel. 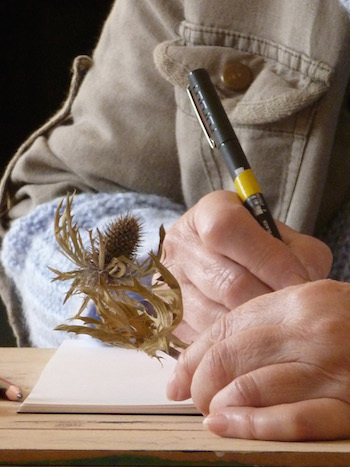 Mindful Drawing workshops range from a short taster session to a 1- or 2-day workshop. 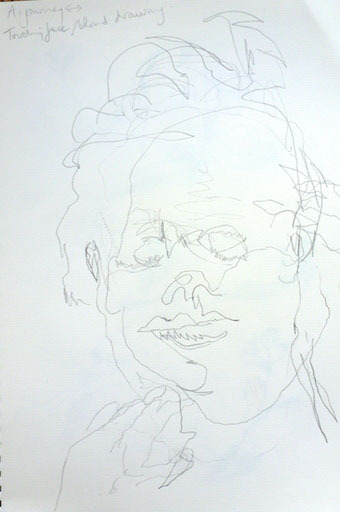 The sessions draw on the work of Frederick Franck (The Zen of Seeing) and others, and my own practice, and are an exploration of drawing as meditation. Sessions also include short periods of guided meditation but no prior meditation or drawing experience is needed. This is not a how-to-meditate or how-to-draw workshop but an experience of drawing as meditation. "Helped me move on with my drawing which is what I hoped." "Helped me back into finding value in drawing. Was respectful, thoughtful and professional teaching." "Wonderful. I didn't know what to expect when I enrolled but I thoroughly enjoyed the course and the outcome was better than I could have imagined." "The course was an amazing experience for me. I definitely feel a shift in the way that I see, draw and feel about drawing. Before drawing was difficult and took a lot of energy, now it feels effortless, peaceful and relaxing - like meditation."